Every year, businesses spend hard earned profits on technology to speed up the sales process. There are applications to generate more leads, to rate and route leads to salespeople, and to manage sales activities and tasks like scheduling appointments; preparing and delivering presentations; and creating and sending proposals. When you add the cost of office equipment and maintenance - paper, ink, envelopes, filing cabinets and storage space - the amounts are even more staggering. 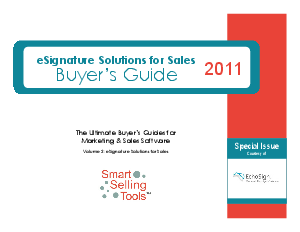 But the biggest reason to switch to eSignatures - the reason that trumps all others, even the inefficient use of man-power and capital - is the reduction in the "time-to-signature." The time-to-signature is the average amount of time needed for a document to go from submission to signature and it's a metric that has bearing on a firm's productivity and ability to compete.